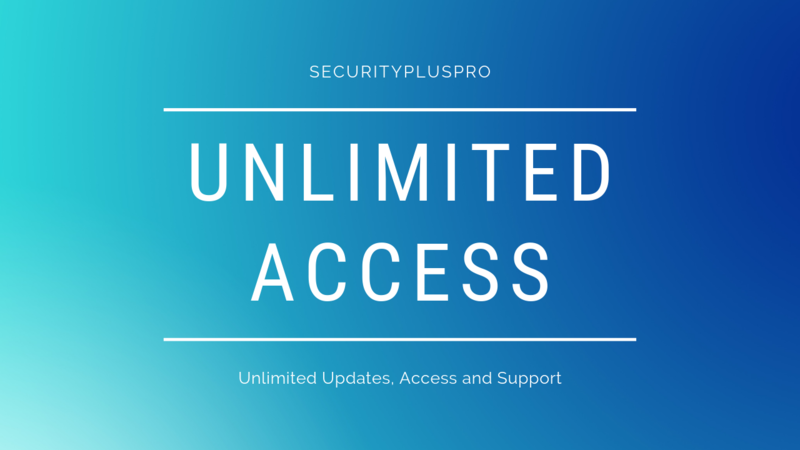 How would you like to have unlimited access to all the course material released on securitypluspro.com... forever? That's the goal behind our new subscription plan. Let's face it: some of the courses on our site are expensive but that's because we offer a ton of value. The truth is that some of our students simply can't afford some of our premium offerings. We understand that many of you are students and others are justing getting started with new careers. We wanted to make our learning material accessible to everyone so we've released a new billing model that lowers the barrier to entry while giving you a steady stream of learning material to conquer the Security+ Exam. Peace of Mind. You'll have unlimited access to all courses currently on the site and first dibs on new courses as they are rolled out. You'll also get unlimited updates so as the exams mature and technology evolves your learning material will keep pace and stay updated as well. Freedom. You always have the freedom to cancel your subscription at any time. We understand some of you might just want one course or maybe even a few lectures. That's why we've designed everything to be modular so you can pick and choose what you need when you need it. Need to quickly brush up on building Windows Server lab? You'll have access. Need a quick tip on running a Penetration Test? You can jump right in and look at those videos. Everything you need is in one place. Results. Our training material is designed with one goal in mind: results. We designed our learning curriculum to not only help you pass the Security+ exam but also bolster your confidence so you'll hopefully accept more challenging job interviews and take on more challenging roles at work. The bottom line is we want you to succeed; therefore, if you feel dissatisfied for any reason, you can request a full refund within 30 days, no questions asked. It's as simple as that. So what are you waiting for? Join today and let's get started! Get Instant and Unlimited Access to ALL courses for one low monthly subscription.